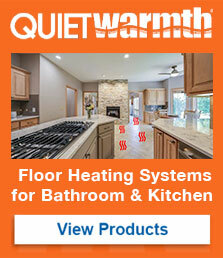 QuietWarmth follows UL standards and can be installed outside of wet locations. QuietWarmth can not however be installed in wet areas. A location in which water or other liquid can drip, splash, or flow on or against electrical equipment. A wet location luminaire shall be constructed to prevent the accumulation of water on live parts, electrical components, or conductors not identified for use in contact with water. Yes, if you are placing the mat in front of a vanity or outside of the shower and is not consider a wet spot. According to our instructions, we say no because the mat can not be placed under wet areas such as shower pans and bath tubs, suanas. Anything that UL considers wet locations. PreviousPrevious post:Do You Need Special Tape to Install Floor Underlayment?NextNext post:Is a separate moisture barrier required?